This wood end cap display unit can be used to highlight special product. 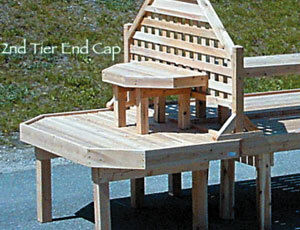 The second tier helps break up the monotone of long flat benches and spot lights products. This wooden end cap can be combined with another to form a circular display or can be placed against a wall. B3EC 36" wide x 18" deep x 18" high 19 lbs. TR4 Small Second Tier Table (46Lx18Hx20D) 25 lbs.